Students measure the voltages generated by a series of different pairs of half cells using the Electrolytic Bridge. 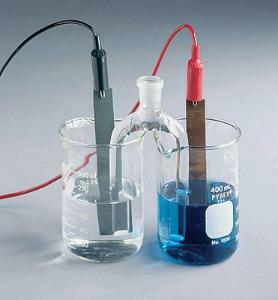 When you immerse an electrode in its own salt, a half-cell voltage is generated between the electrode and the solution. Measuring half-cell voltages is difficult as they have only one electrode. The Electrolytic Bridge separates the cell into two halves and connects them with a separate electrolyte. By measuring a series of electrode materials against a single standard, half-cell voltages can be established. The apparatus consists of a Y tube with an overall length of 9 cm. The end of each arm is fitted with a special ceramic material that lets ions pass but filters electrolytic fluid. Ordering information: This kit includes instructions. It requires a voltmeter, sold separately.